Knesset Speaker Edelstein calls for iron wall on Israel's northern border, says Israel must prepare for events ahead of time. 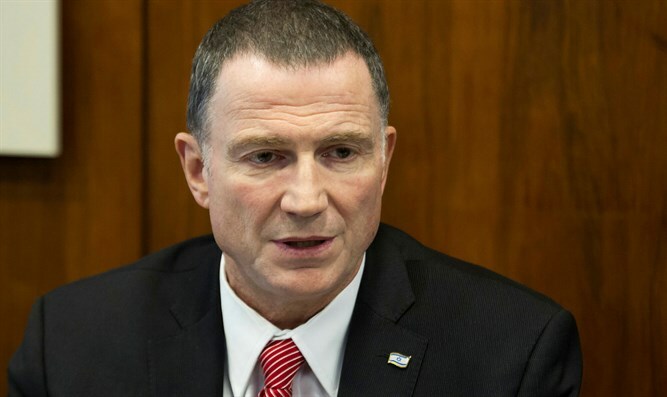 Knesset Speaker Yuli Edelstein (Likud) on Wednesday spoke about the dangers on Israel's northern border. At an event commemorating the anniversary of Ze'ev Jabotinsky's passing, Edelstein said, "Jabotinsky's legacy require us to fortify the Syrian border with an iron wall." "For dozens of years, the leaders of this State despised Jabotinsky and made him out to be a dangerous person," Edelstein explained. "Today, it's clear how wrong they were, and how important his legacy is." "Today, we are witness to the creation of a new reality on the Syrian border. We don't know who will control the area in the future, and how long the bloodbath will continue. Jabotinsky's legacy obligates us to fortify the Syrian border with an iron wall. "We will continue dealing with humanitarian issues on the border, but at the same time as one hand is outstretched, the other hand must place a boundary: We will continue protecting the security of northern Israel's residents! Jabotinsky's legacy is to take our destiny into our own hands, to prepare for events ahead of time, and not to give in to them apathetically after they're already happening to us. We ourselves need to ensure that the eternal fire of the Jewish nation will never be extinguished. Jabotinsky was a Russian Zionist leader who in 1923 wrote "The Ethics of The Iron Wall," a timeless document which simply and rightfully argues that morality comes before everything else and explains that Zionism is "moral and just."